Please contact us with any questions or suggestions you may have using either the Information below or fill out our contact form. Where did you hear about The Dag? 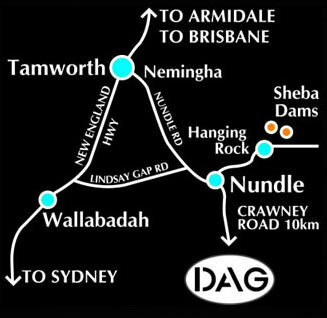 Turn off on to Lindsay Gap Road and follow to Nundle. At Nundle turn right at Peel Inn (pub) and follow Jenkins St/Crawney Road for 10km's and you’re here! Turn off on to Nundle Road and follow to Nundle. At Nundle turn right at Peel Inn (pub) and follow Jenkins St/Crawney Road for 10km's.